Eddie has a Ford GPW, SN 24407 with a D.O.D. 5-18-42. The engine was assembled at Rouge River Plant on April 26,1942 and was assembled into complete unit at Dallas Branch Plant (factory info courtesy of Jim Gilmore and his research). Registration Number: 20111357-S (I have seven different verifications for this number). Eddie also has an original top, headlights, and webbing. One other thing about the jeep, according to Eddie. It was in the mechanics shop at Camp Mabry (Austin, Texas) in Sept. 1944. This place is less than 100 miles from Fort Hood. The brass repair plate on the motor said that the crankshaft was ground 20/20. Last year (2003) Eddie ground the shaft an additional .010 when the motor was rebuilt. Front shot. 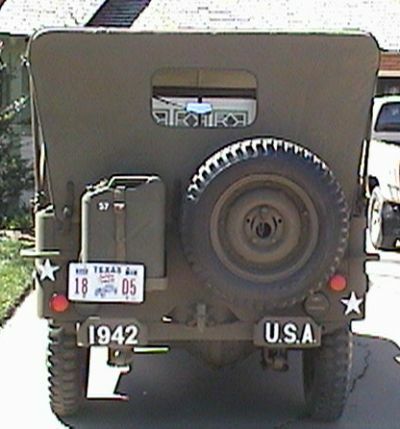 The jeep appears to have always had U.S.A. on right side of bumpers. Eddie doesn’tknow what was on the left side. 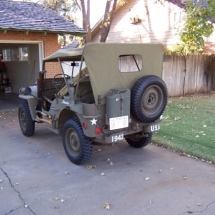 It should also be of interest to all that Eddie has his jeep painted with paint that was manufacturered during WW2–that’s right original lustreless olive drab. Side view of Eddie’s very well done jeep. 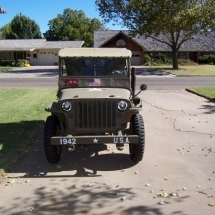 On both sides of the hood were stenciled the registration number of the jeep, these numbers appeared on four seperate layers of paint from 1942 to 1945. The number under the hood was crudely hand painted and in a yellow color. 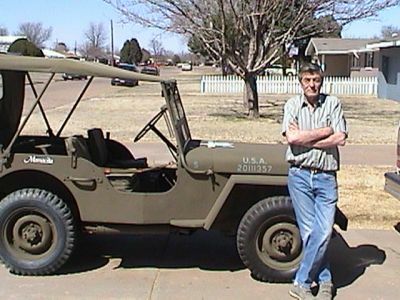 The original owner of the jeep related that there was a row of jeeps being auctioned at Fort Hood on that day. He said several hundred people were there inspecting the jeeps and other equiptment preceding the auction. Eddie comments, “It is my idea that, with all of the hoods being raised, for inspection, a matching registration number was painted under the hood for easy identification and recording by auctioneers, and Army accountants.” Mamacita. The tactitcal name of the jeep that Eddie found. 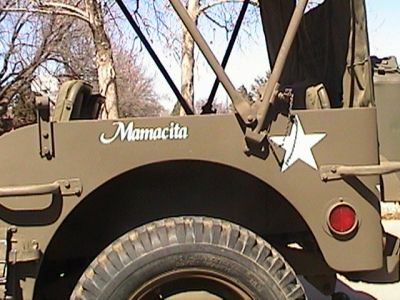 According to Eddie the jeep had “Mamacita” above rear wheel wells in 1943 and 1944. Rear view. 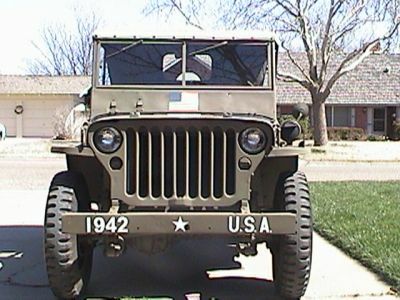 Other than “U.S.A.”, unit markings were absent from the jeep. 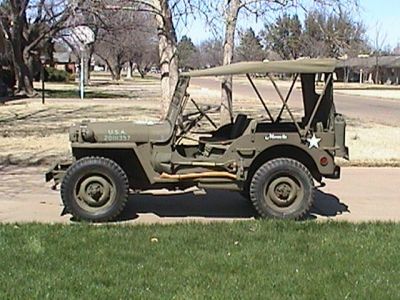 The jeep was used at some point as a radio vehicle, and there is some evidence that by 1944 it may have been used by a general officer. 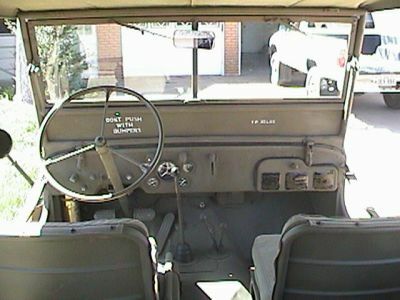 Passenger side of the vehicle. Eddie said he made these pictures under bright sunlight so that you could see the color of the 1944 O.D. paint. Note how dark the paint is where ever a shadow hits it. Now we will look into the engine bay. First thing we notice as we open the hood is that the registration number is painted under the hood. Pretty neat. 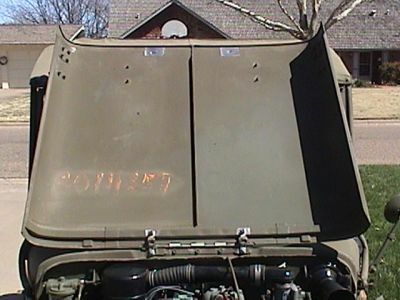 You too might try carefully sanding under the hood to see if you can locate your numbers. 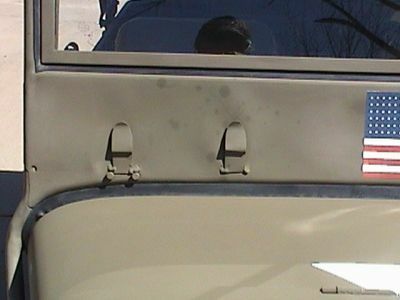 Also notice the “short” style of bonding straps (hood to cowl). 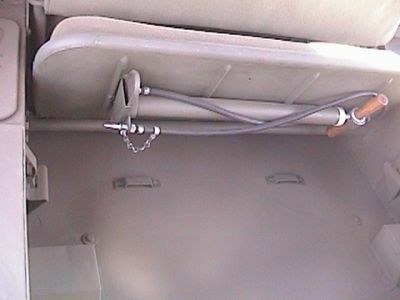 Later jeeps would have longer straps that were mounted at angle. Looking up at the upper edge of the hood you can see two tinned areas. A part of the bonding system would be my guess. The engine is very nicely detailed, complete with the Ford style of sparkplug “umbrellas”. 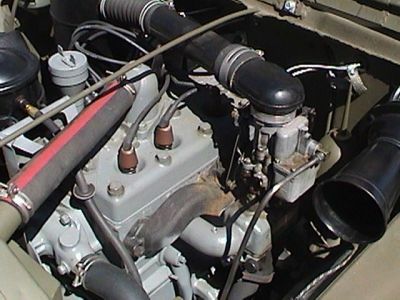 Note the early down draft tube coming out the side of the valve cover and, also, the intake manifold without bosses (indicative of early jeep engines). Eddie even has headbolts on that engine. 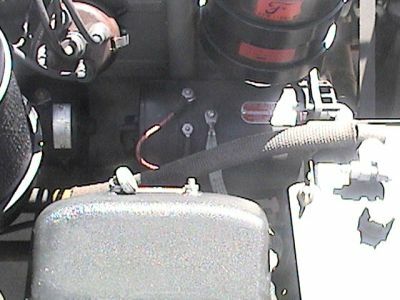 Looking toward the passenger side of the engine we note the voltage regulator, fuel filter, air filter and oil filter. Another closeup. 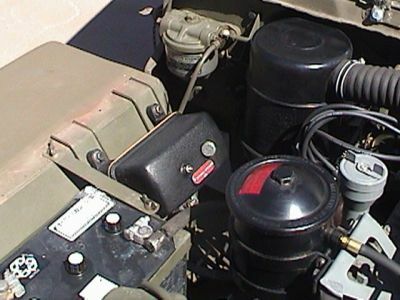 Note the brown distributor cap and other details. Looking up, we spot on the windshield two brackets welded into place. They appear to be a sign holder of sorts. Could this have been for a general’s insignia plate?. 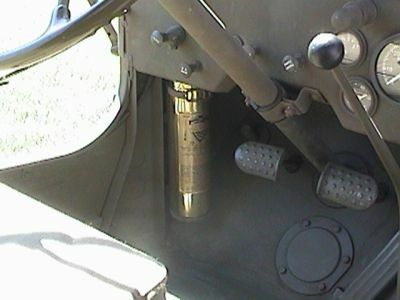 The brackets on the windscreen are spaced and located in such a manner that they seem to properly hold a six by nine inch placard. This is the size that is required, according the AR260-10, for General Officer identification. 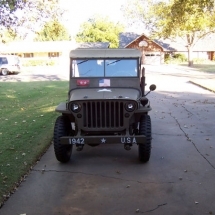 One other thought on the brackets on Eddie’s jeep: Since it was a radio jeep, at one time, the plate might have been nothing other than a frequency number, or in war games a regiment or company designation. After all Fort Hood was a training base at the time. 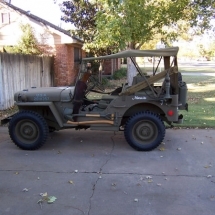 Eddie told me about an incident that happened involving his jeep, “What Belongs to Whom”: “Within minutes following the funeral of the old man who owned my jeep from 1946 to 1985. The family appeared at the museum where I had the jeep in one of the basement laboratories. They asked if they could go down to see the jeep. We maintain close security on the storage areas of the museum, so after about an hour I went down to see if everything was okay. Of course, they were telling stories about learning to drive in it and about working in it, but I’ll swear…they were talking to the darn thing. 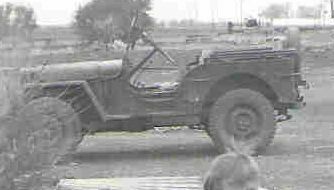 They remained with the jeep for the remainder of the day and left well after closing time of the museum.” The drivers side windshield has the proper Ford symbols that indicate manufacturer (Ford) and date of manufacture in code. 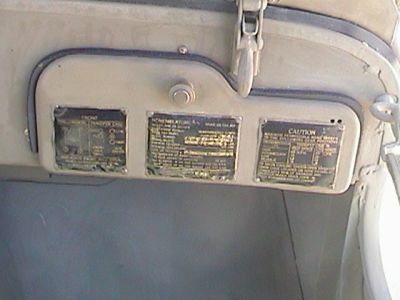 Inside the jeep, we see the instruments, fire extinguisher and the data plates. Also present are two warnings or advisories that Eddie found. “Don’t push with bumpers” and tire pressure information. Eddie went on to say about the original owner had told him about the jeep, “I believe he said that there were about two dozen jeeps lined up. It seems that it was a general surplus auction that included various vehicles, generators, tents, and, I suppose belts, pouches etc.” A nice brass fire extinguisher, originally filled with carbon tet…not a safe product by modern standards. 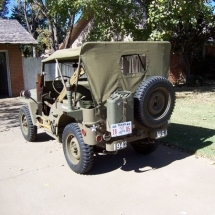 Eddie continued, “An intresting side line to the story, after applying for and getting his permit to bid on government property, he drove the 125-150 miles to Fort Hood, arriving in time to go through the process of inspecting and selecting which jeep he wanted. He picked two he liked before the auction began. As the day wore on and grew hotter one of his jeeps came up and sold, too high for him. Growing wearyof the long auction and high prices, he returned home without bidding on anything. 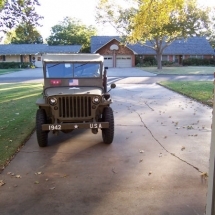 About three weeks later he received a post card from Fort Hood that informed him that two jeeps were remaining, and he should return to look at them. As it turned out one of the remaining jeeps was one he had selected earlier. 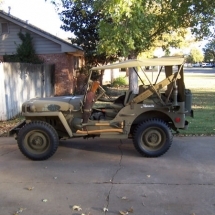 He bought the jeep at an average price of the auctioned jeeps.” Lifting up the passenger seat we see two single straps used to stow the top when removed. Note: Another school of thought says that there should be 4 straps (one mounted to each footman loop). A decontamination unit, M1. 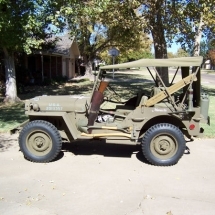 This unit would not have been originally mounted in the jeep when first issued. 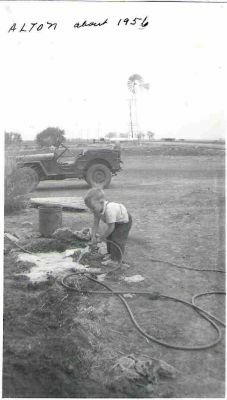 The factory which did not supply the M1 would later pre-drill holes and provide mounting screws for later jeeps. However, the military would retro-fit existing jeeps with decontamination equipment. 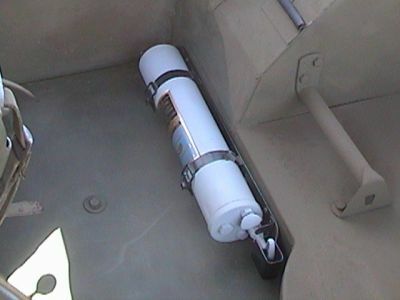 Early jeeps like Eddie’s would have had a rubber gasket used with the glovebox to act as a seal. 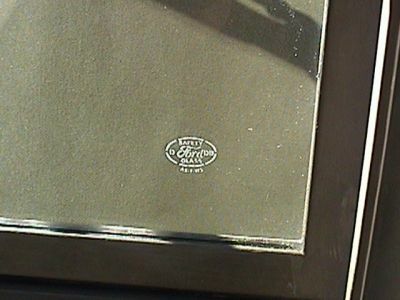 Also the dataplate would be a little plainer then later jeeps–no script Ford…that would be on the rear of the vehicle. 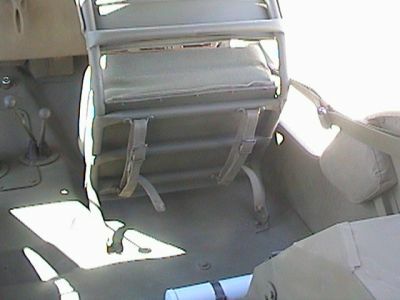 Under the rear seat two loops have been affixed to the floor. Anyone have an idea what they were for? These pictures are from the previous owner’s family. They were kind enough to share a couple of pictures they had of the jeep and their family. The original owner’s name was Owen Egger. He is the man with the .22 cal. 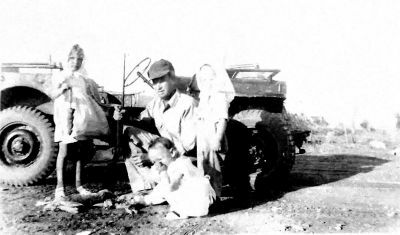 rifle, following a jack rabbit hunt with his children (1952 photo, near Abilene, Tx. ). 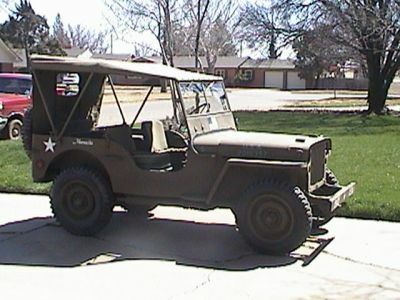 Eddie Guffee was kind enough to generate some photographs of his jeep taken at different periods of the day. While each monitor may make the paint look different it is neat to see the reflective qualities of the paint. Click on the pictures for a larger view.